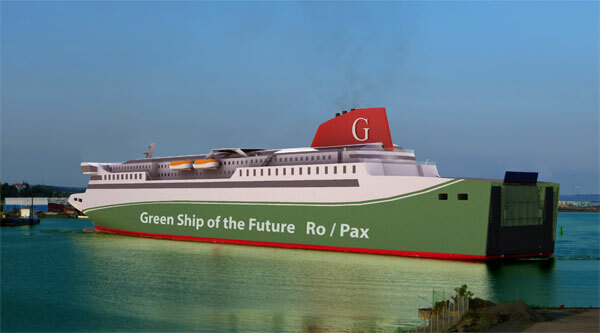 In the spring 2011 the private-public partnership Green Ship of the Future initiated a 'low-emission' ferry study. The study was agreed to be carried out as a collaborative development study involving partners from all over the maritime industry to work together on optimising a ferry for a given operation. In order to achieve this, a facilitator was brought in and given the task to obtain the desired synergies within the project group. In order to benchmark the findings, the existing RO-PAX ferry M/F VISBY, was used. This ferry is currently operated by Gotlandsbolaget between the harbour in Visby at the Swedish island Gotland and mainland Sweden. Gotlandsbolaget have several years experience with operating this route and have an extensive database of energy consumption on board the vessels whereby benchmarking of potential emission reductions is possible. The study was managed by OSK-ShipTech and during the study, the partners have contributed through subgroups where their technical expertise could contribute. The overall objective of the study has been to provide insight into what can be done in order to reduce emissions from ferries. In this regard, the study has aimed at utilising and sharing technical and operational expertise among all the study partners. The technical target of the study has been to reduce the CO2 emissions by 25% compared to the (well-designed) ferry already in operation between Gotland and Sweden. The technological and political environment in the maritime world continuously changes the possibilities and requirements. Therefore, the design aim of this environmentally friendly RO-PAX concept has aimed at being ready for order before 2020. In this context it is relevant to mention that some findings can be implemented as retro-fit in existing vessels. Technically speaking, the study has focused on elements relating to design, machinery, propulsion, alternative fuels and other areas affecting emissions. But in order to combine the technical findings in the best way possible, a certain focus on the “softer” issues such as knowledge-sharing and collaboration has been necessary. In this regard focus has been on exchanging knowledge between the partners and utilising the shared knowledge in the optimisation process. This might seem elementary, but given the borders between businesses this has been a greater obstacle which has demanded extra focus. The study partners have not been promised any payback on their contributions. But the Danish Maritime Fund has been supporting the coordination of the study financially. From a technical perspective it was concluded that it is possible to reduce the fuel consumption considerably by introducing new technologies without changing the operational parameters. The effects of the optimisation and the selectedtechnologies have led to a fuel cost saving of more than 23%. This saving is significant but also very dependent onthe future cost of fuel. All the technologies included in the design have a paybackperiod of less than 5 years. By introducing these technologies the savings onemissions are: 39 % on CO2, 93 % on NOx and 98 % on SOx, meaning that the technical target is reached.